The Bob-Whites collected their things and walked to the door of the cafeteria, arriving at the same time as Jerry Vanderhoef. 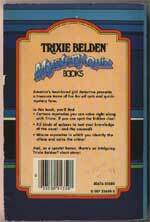 "Hey, Supersleuth Trixie," the boy said loudly. 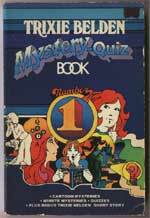 "I heard there's another mystery for you to solve. Or are you letting that new kid handle all your cases for you?" Trixie felt her face growing hot with anger, but, feeling Jim's hand on her arm, she forced herself to say nothing, and Jerry turned his back on the Bob-Whites and walked away. "He's really got it in for you, Trixie, hasn't he?" Dan said. Trixie shrugged. "I can take, I guess. I don't enjoy it, but I don't think enough of Jerry Vanderhoef to let his criticism bother me." "Good girl," Jim murmured approvingly as the Bob-Whites reached the end of the hallway and went to their separate classes. Trixie found herself smiling contentedly as she walked down the hall. See there? she thought. Why should I let someone I don't care about bother me, when just two words from someone I respect, like Jim, can make my whole day? Kathryn Kenny with Joan Bowden, Mary Carey, Eileen Daly, Laura French, D. J. Herda and others. A Quetzal in a Williwaw? R U 4 K9's, 2? It's True .. . It's False .. . Oh, I Give Up! There are a string of thefts at Sleepyside High and Trixie is keen to solve the mystery, but the new girl, Carol, beats her to it each time. Has Trixie been outwitted or does Carol know more about these thefts than she's letting on? Three new street names in Sleepyside are introduced: Crabtree Lane (p. 60), Elm St and Parsons Court (p. 108).